Stargazers at the annual Dakota Nights Astronomy Festival in North Dakota's Theodore Roosevelt National Park. Red lights help people move between telescopes without ruining their night vision. Flares and electric lights from numerous oil wells are visible on the horizon from the edge of the Little Missouri State Park in western North Dakota. Top, Minimal light pollution is visible just outside the McDonald Observatory in 2006, before oil and gas development in the Permian Basin took off. Bottom, nearly the same spot nine years later. Manning a massive telescope at Theodore Roosevelt National Park's Dakota Nights Astronomy Festival, volunteer and astronomy-buff Jay Bjerke wasn't looking to starry skies. Instead of the Milky Way, he was looking toward a butte on the horizon silhouetted by a soft glow. "You can't see stars between the horizon and 20 degrees up," he said, pointing. "That's the oilfields." Behind that North Dakota butte, natural gas flares were blazing just outside the park fence. 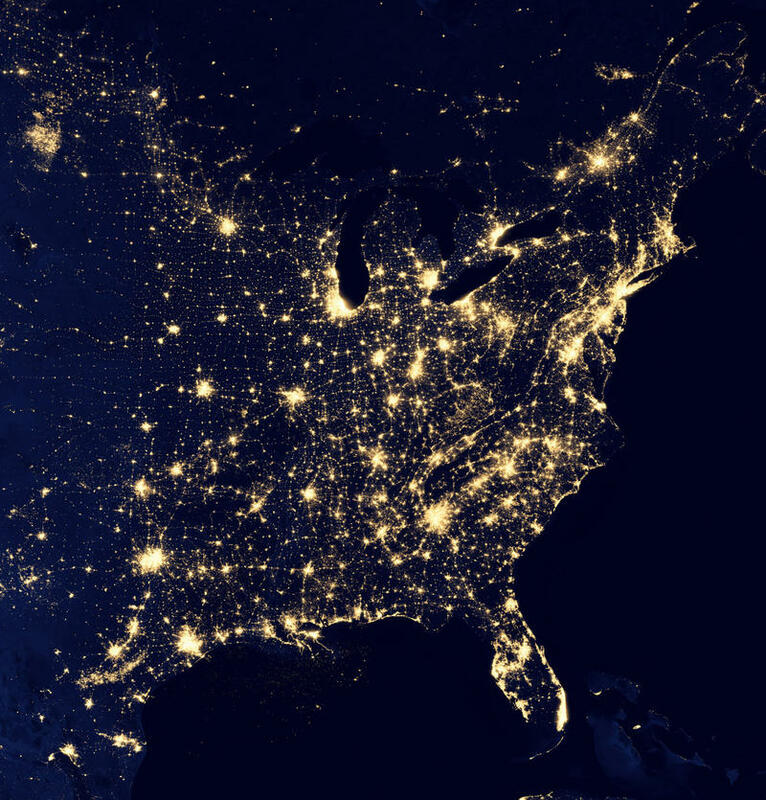 As oil development exploded in recent years, so has the amount of light pollution in some of the nation's dark and far flung places. Theodore Roosevelt National Park Ranger Jeff Zylland has documented the nearby flares and other sources of light pollution during many summer nights spent driving the gravel roads that encircle the park, looking for the cause of the mysterious glow. In addition to flares, he blames equipment yards, drilling rigs and other development indirectly related to the oilfield: gas stations, strip malls and new housing. "Whenever there's growth that happens really fast, people don't put a lot of thought into their lighting," he said. The National Park Service's Natural Sounds and Night Skies Division actually measures light pollution with a special camera. Between 2010 and 2013, visible man-made light in the north unit of Theodore Roosevelt National Park – closest to the heart of the Bakken oilfield – increased by 500 percent. That's faster than at any other national park in the country, Bob Meadows, a park service scientist pointed out. Bright lights shine on a well development, where activity continues throughout the night, near the Little Missouri State Park in western North Dakota. The small staff at Theodore Roosevelt National Park has essentially been in triage since the oil boom began, light pollution hasn't always been a top priority. "It's really hard to get in front of something that's moving that fast and that is that big," said Eileen Andes, the chief of interpretation and public affairs at the park. "It's hard to deal with a lot of critical things at the same time when you're short staffed." In 2014, park rangers began looking into light pollution more seriously, producing a series of educational videos that talk frankly about the impact of oil development. The staff at Theodore Roosevelt aren't as proactive, or as ambitious, as Bill Wren, the light pollution guru at the University of Texas' McDonald Observatory. His goal is "nothing short of changing the way oil and gas industry lights their nighttime activities." There's a sense of urgency in Wren's work, because light pollution from the near-by Permian Basin oilfield could jeopardize the work being done at the observatory in West Texas, about 450 miles away from the main campus in Austin. "If the sky gets brighter than the faint source we're trying to see, then it's lost," Wren said. So he's reached out to some of the oil men that work there, and found one with a soft spot for West Texas: Stacy Locke, the CEO of Pioneer Energy Services. Downward-facing lights, like these at an oil shipping terminal in Fryburg, North Dakota, help prevent light pollution. Locke's wife's family has a ranch near Marathon, Texas, and he said the dark skies are one of his favorite things about the area. It's also something he took for granted before meeting Bill Wren and realizing the impact that oilfield lighting was having on the night sky. Immediately wanting to help, he and Wren worked together to make Pioneer's newest drilling rigs "dark-sky compliant," and they co-authored a study that they hope might lead to industry best practices. The fixes, it turns out, are pretty simple — pointing lights on drilling rigs and well pads down, switching to warmer-colored bulbs and LEDs — and they protect worker's eyes from harsh glare. The key, Locke said, is getting the companies that own the well sites on board. "They hire all the service providers, so they can mandate, 'Hey, if you wanna work for me, your equipment has to be dark-sky compliant,'" Locke said. Bill Wren says light pollution may be decreasing, but it's probably because there's been a major slowdown in drilling activity in the last year when the price of oil started plummeting. As for North Dakota, Locke wasn't aware of the oilfield light pollution problem there, but now that he is, he's interested in being part of the solution. The Colorado Oil and Gas Conservation Commission, the state's regulator, is proposing a new set of rules that would give local governments more say over drilling operations. The draft rules require engagement with local officials before applying for a large-site drilling permit from the state. Some towns in Colorado are already ahead of the state on this. In the early 2000s, the town of Erie had just about 12,000 residents. But the open fields and farmlands of this Front Range community have been converting to housing developments fast. Now 22,000 call Erie home and that number is expected to triple by 2050. Scattered across that urbanizing landscape are oil production sites and places where more drilling is planned. Up until recently, town trustee Jennifer Carroll said, there wasn't much Erie could do to control new drilling. Wyoming is fighting hard to keep its coal on the market in the future, no matter the form. Why? Because, according to Wyoming's Economic Analysis Division, revenue from coal accounts for a whopping 25 percent of the state's budget. That dependence is underscored by announced cuts to the budget, courtesy of lower-than-expected energy revenues. As global pressure to address climate change mounts and market forces continue to work against the black rock, researchers and policymakers in the state and in coal producing regions all over the world are scrambling to figure out what to do with coal other than burning it.